Doug Casey says this will be a big deal. On December 4, 2016, an Italian referendum will occur, and voters in Italy will decide the fate of the sitting prime minister, Matteo Renzi. Should "NO" be the result, it will be the first step in Italy leaving the EU, dropping the euro as a currency, and possibly regaining economic and political independence. So, while American media have not mentioned this much as yet, a moment's thought suggests that Doug Casey might be right about its importance. Transiting Jupiter return, trine Italy Uranus and Sun: renewed vigor and energized rebellion. The Jupiter return is square Italy's Pallas, however, giving us one "authoritarian" vector. 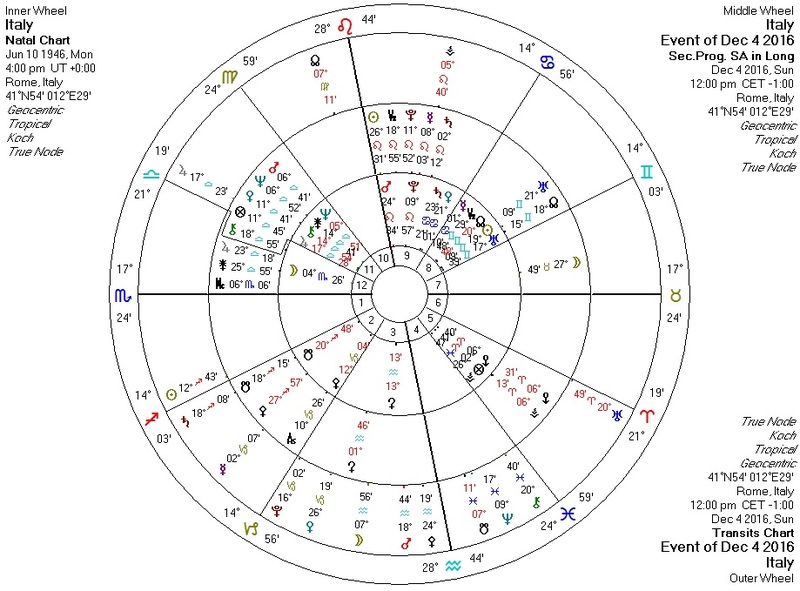 The Pluto square to the Italy Jupiter return position does suggest some kind of massive disruption, one in which populist will (Jupiter in Libra) opposes entrenched power (Pluto in Capricorn). Transiting Sun semisextile Italy Pallas and quintile transiting Pallas; transiting Mercury conjunct Italy Pallas and progressed Pallas; transiting Pallas novile Italy Pallas: lots of "libertarian" vectors. It looks, in fact, very similar astrologically to the US election of Donald Trump. The polls suggest that executive power-grabbing referendum will fail, potentially triggering "Italeave". The astrology appears to confirm this, but only time will tell us for certain.